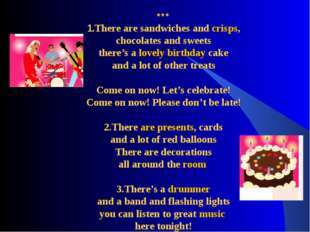 *** 1.There are sandwiches and crisps, chocolates and sweets there’s a lovely birthday cake and a lot of other treats Come on now! Let’s celebrate! Come on now! Please don’t be late! 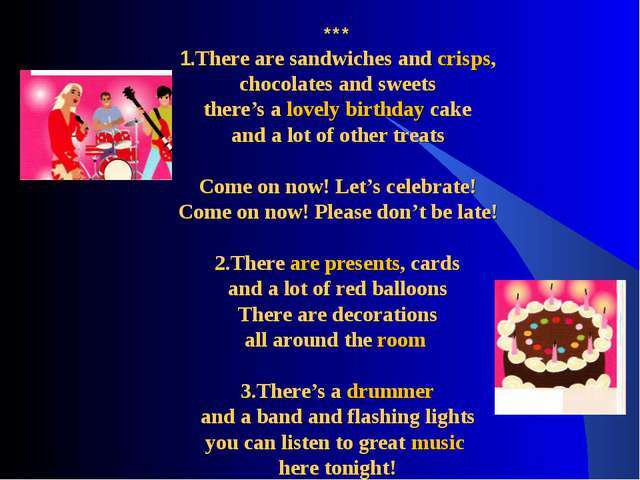 2.There are presents, cards and a lot of red balloons There are decorations all around the room 3.There’s a drummer and a band and flashing lights you can listen to great music here tonight! 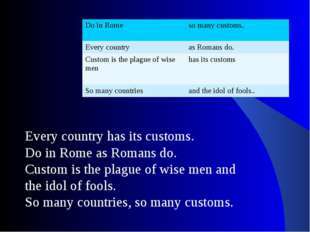 Every country has its customs. Do in Rome as Romans do. 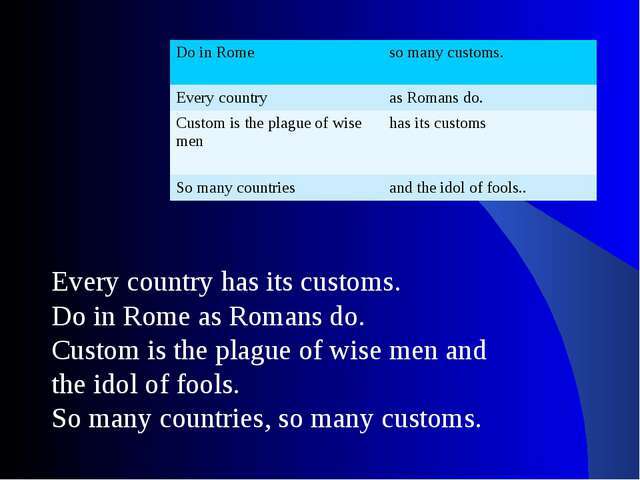 Custom is the plague of wise men and the idol of fools. So many countries, so many customs. Do in Rome so many customs. Every country	as Romans do. 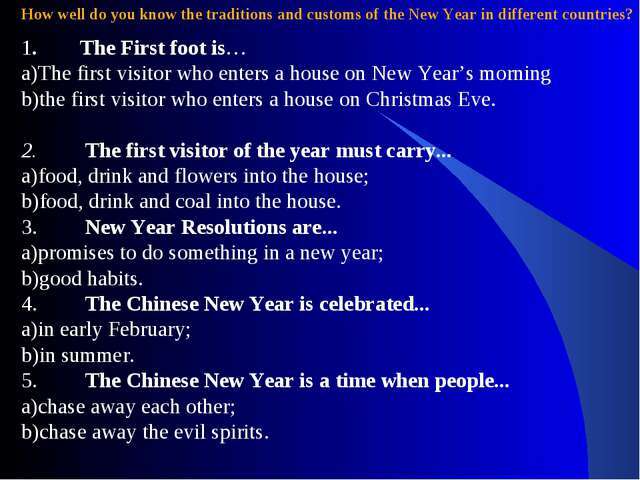 Custom is the plague of wise men has its customs So many countries	and the idol of fools..
How well do you know the traditions and customs of the New Year in different countries? 1. The First foot is… The first visitor who enters a house on New Year’s morning the first visitor who enters a house on Christmas Eve. 2. The first visitor of the year must carry... a)food, drink and flowers into the house; b)food, drink and coal into the house. 3. New Year Resolutions are... a)promises to do something in a new year; b)good habits. 4. The Chinese New Year is celebrated... a)in early February; b)in summer. 5. The Chinese New Year is a time when people... a)chase away each other; b)chase away the evil spirits. 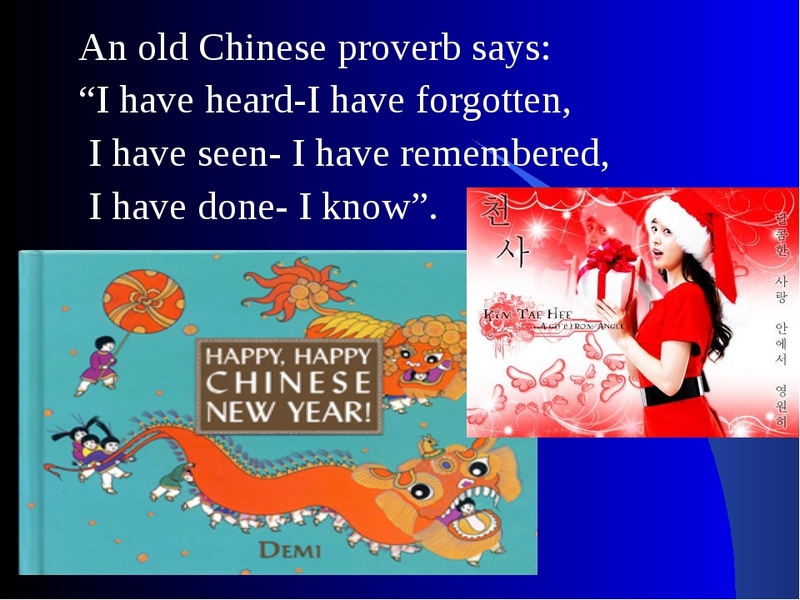 An old Chinese proverb says: “I have heard-I have forgotten, I have seen- I have remembered, I have done- I know”. Samurai is afraid of princess, but can win dragon Dragon is afraid of Samurai, but can win a princess Princess is afraid of dragon, but can win Samurai with her love. 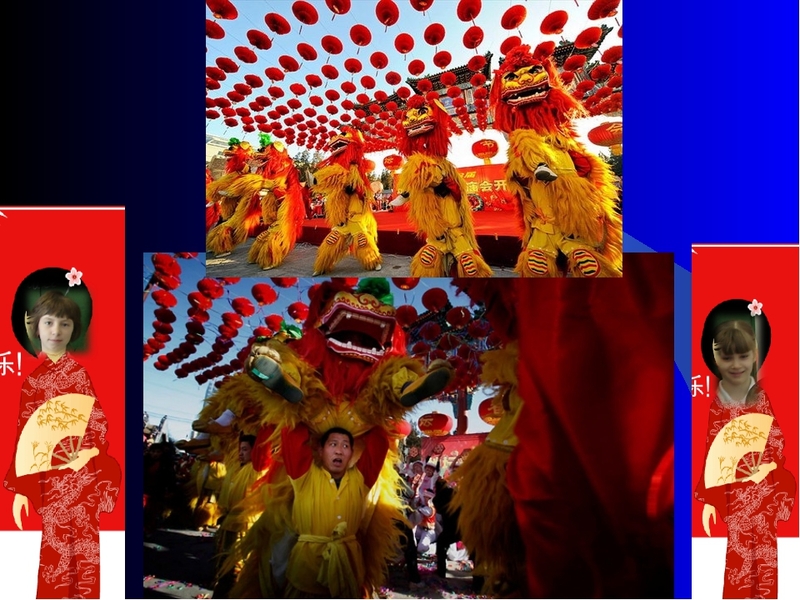 CHINESE NEW YEAR Chinese New Year is celebrated at the end of January or start of February. 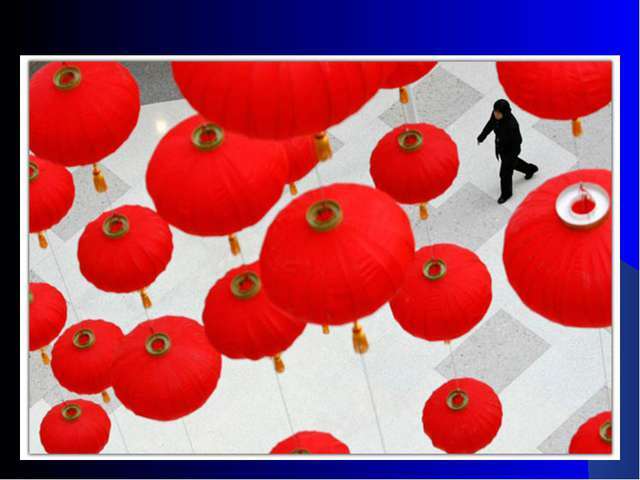 This year, Chinese New Year's day is on February 14, 2010. 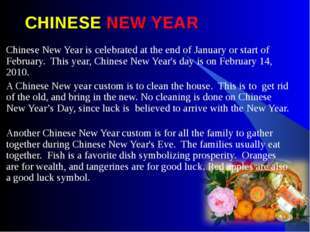 A Chinese New year custom is to clean the house. 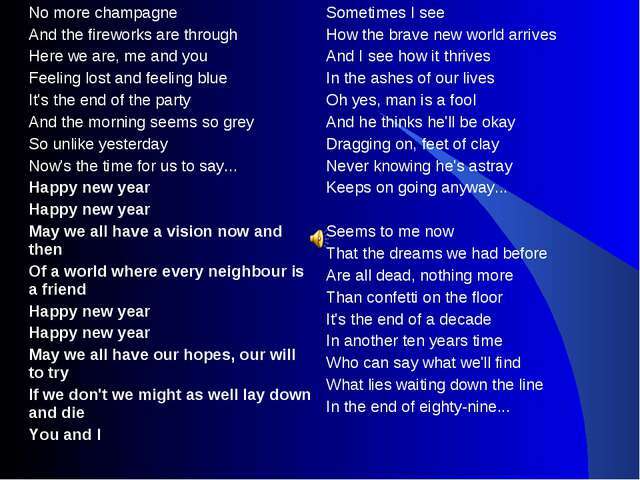 This is to get rid of the old, and bring in the new. No cleaning is done on Chinese New Year’s Day, since luck is believed to arrive with the New Year. Another Chinese New Year custom is for all the family to gather together during Chinese New Year's Eve. The families usually eat together. Fish is a favorite dish symbolizing prosperity. Oranges are for wealth, and tangerines are for good luck. Red apples are also a good luck symbol. 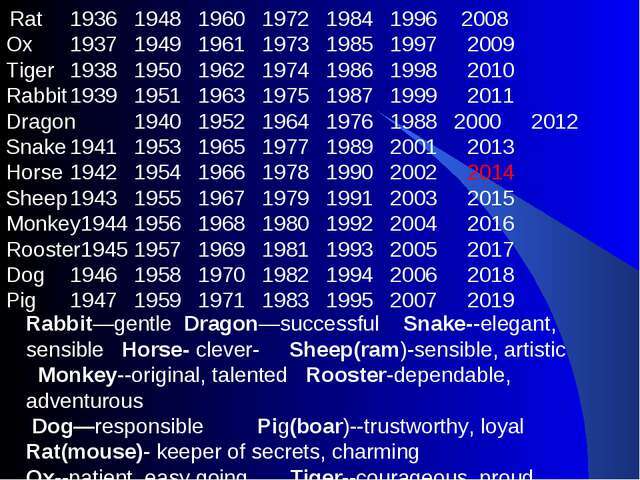 CHINESE ZODIAC - CHARACTERISTICS OF THE 12 ANIMAL SIGNS Millions of people across the planet know a lot about the Chinese Zodiac belief system. 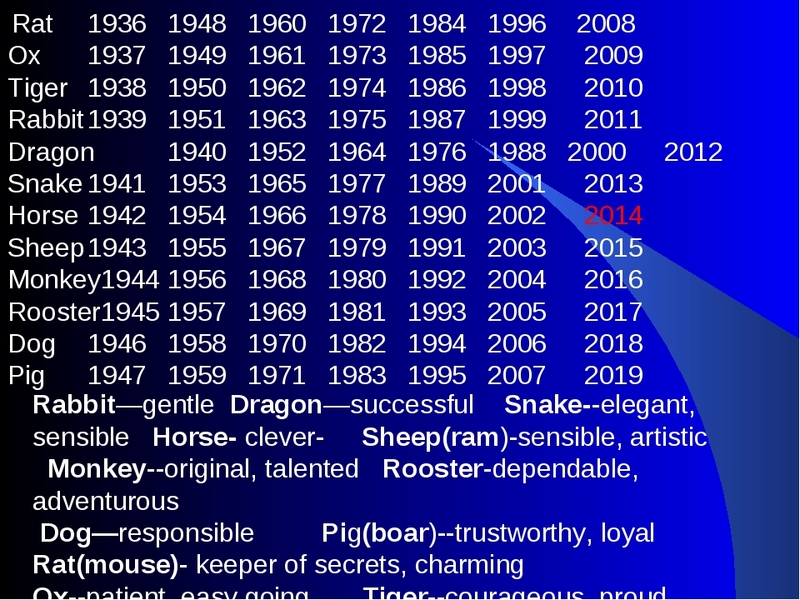 The Chinese Zodiac uses 12 animals that each represents a year in the 12-year cycle. 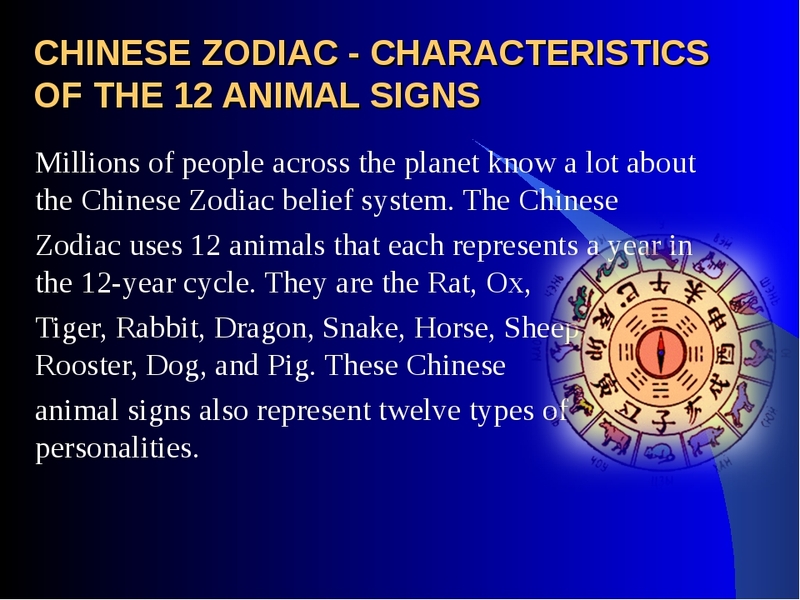 They are the Rat, Ox, Tiger, Rabbit, Dragon, Snake, Horse, Sheep, Monkey, Rooster, Dog, and Pig. These Chinese animal signs also represent twelve types of personalities. Lucky Money in Red Envelopes For Chinese New Year During the Chinese New Year, grown-ups give lucky red envelopes to the children . These envelopes are really good luck for a youngster because these have money inside. 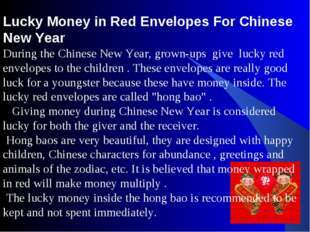 The lucky red envelopes are called "hong bao" . Giving money during Chinese New Year is considered lucky for both the giver and the receiver. 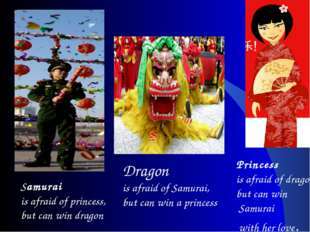 Hong baos are very beautiful, they are designed with happy children, Chinese characters for abundance , greetings and animals of the zodiac, etc. 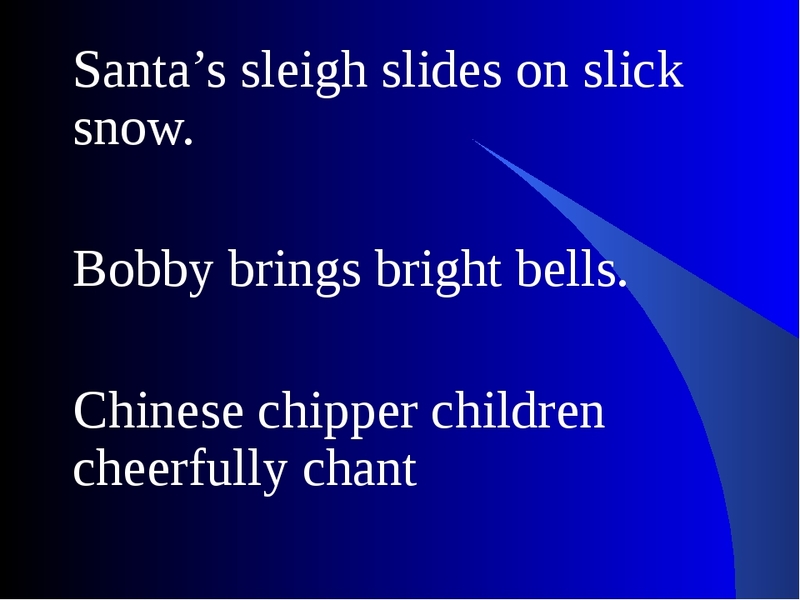 It is believed that money wrapped in red will make money multiply . 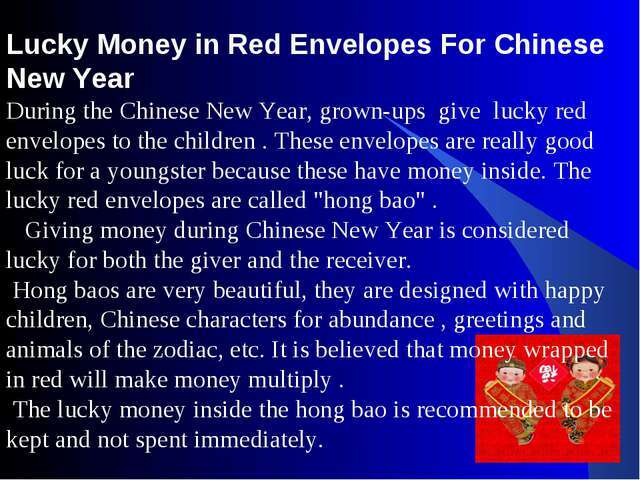 The lucky money inside the hong bao is recommended to be kept and not spent immediately. 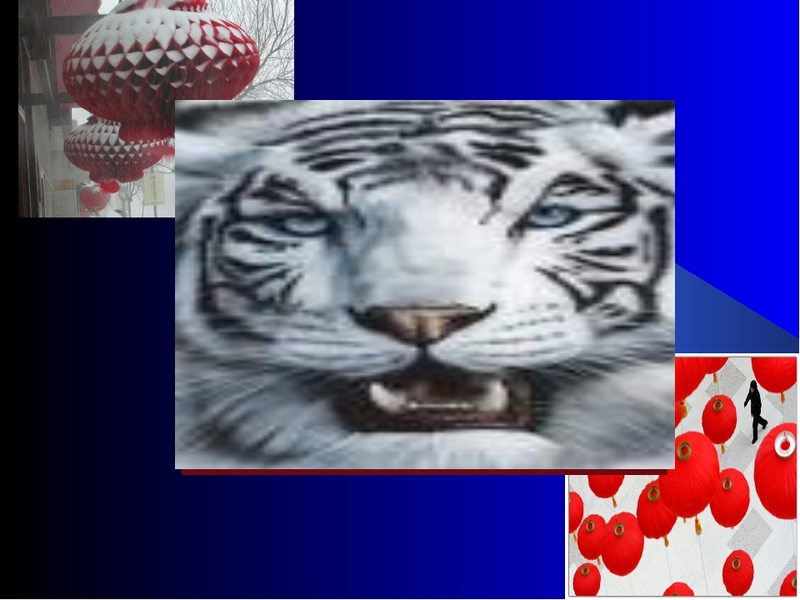 Rat	1936	1948	1960	1972	1984	1996 2008 Ox	1937	1949	1961	1973	1985	1997 2009 Tiger	1938	1950	1962	1974	1986	1998 2010 Rabbit	1939	1951	1963	1975	1987	1999 2011 Dragon	1940	1952	1964	1976	1988	2000 2012 Snake	1941	1953	1965	1977	1989	2001 2013 Horse	1942	1954	1966	1978	1990	2002 2014 Sheep	1943	1955	1967	1979	1991	2003 2015 Monkey1944	1956	1968	1980	1992	2004 2016 Rooster1945	1957	1969	1981	1993	2005 2017 Dog	1946	1958	1970	1982	1994	2006 2018 Pig	1947	1959	1971	1983	1995	2007 2019 Rabbit—gentle Dragon—successful Snake--elegant, sensible Horse- clever- Sheep(ram)-sensible, artistic Monkey--original, talented Rooster-dependable, adventurous Dog—responsible Pig(boar)--trustworthy, loyal Rat(mouse)- keeper of secrets, charming Ox--patient, easy going Tiger--courageous, proud. FINISH 12*. Tell about the tradition of celebrating New Year you have in your family? ( Do you set up fireworks, visit relatives, stay up late, eat special foods, etc?) 1. 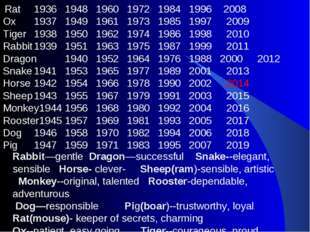 Is the date of the Chinese year moving or not? START 2. 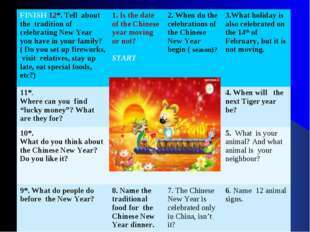 When do the celebrations of the Chinese New Year begin ( season)? 3.What holiday is also celebrated on the 14th of February, but it is not moving. 11*. Where can you find “lucky money”? What are they for? START	4. When will the next Tiger year be? 10*. What do you think about the Chinese New Year? Do you like it? 5. What is your animal? 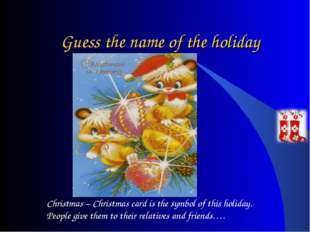 And what animal is your neighbour? 9*. 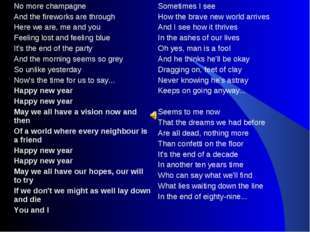 What do people do before the New Year? 8. 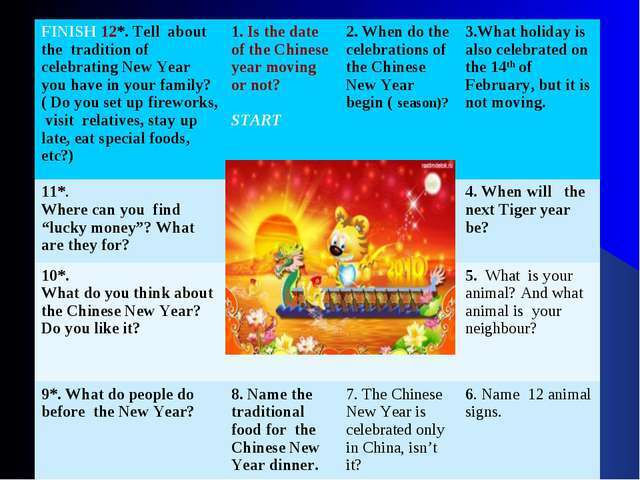 Name the traditional food for the Chinese New Year dinner. 7. The Chinese New Year is celebrated only in China, isn’t it? 6. Name 12 animal signs. Guess the name of the holiday Christmas – Christmas card is the symbol of this holiday. People give them to their relatives and friends…. 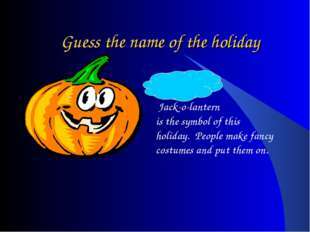 Guess the name of the holiday. 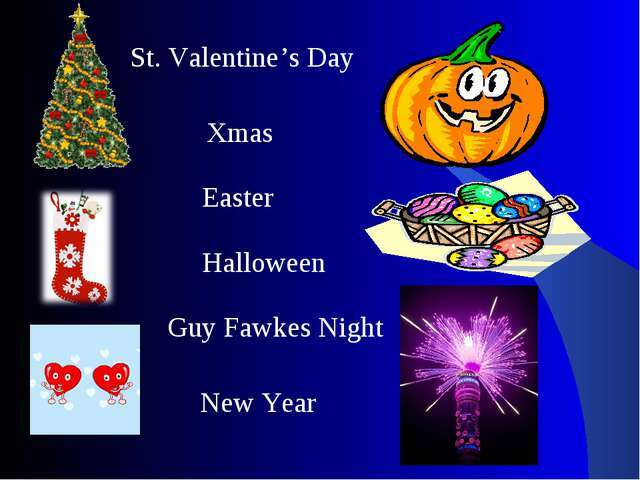 St. Valentine’s Day – because it is the day of love and a heart with an arrow is a symbol of this holiday. People write and send beautiful postcards…. Guess the name of the holiday Halloween – Jack-o-lantern is the symbol of this holiday. People make fancy costumes and put them on. 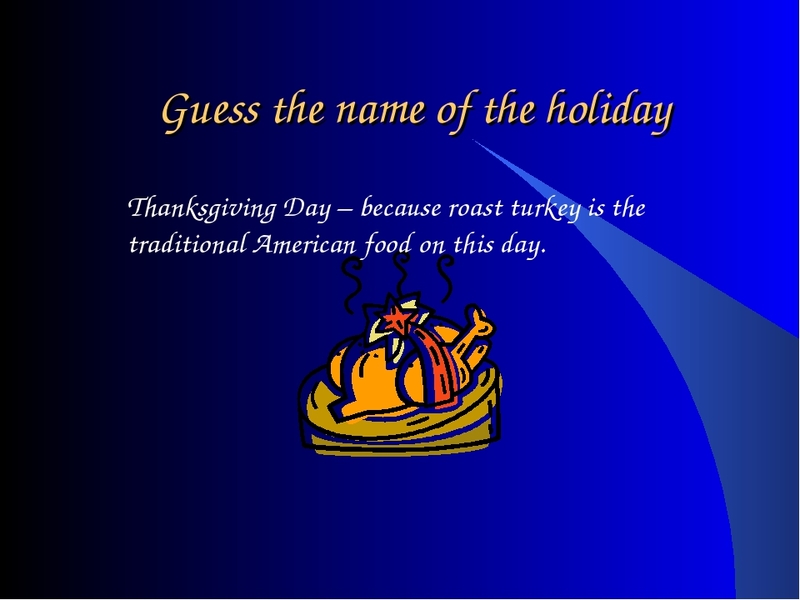 Guess the name of the holiday Thanksgiving Day – because roast turkey is the traditional American food on this day. Guess the name of the holiday. Easter – People dye eggs on Easter. People go to the church and stay for a service. Guess the name of the holiday Birthday – people always buy a cake for a birthday party People invite guests and cook dinner. 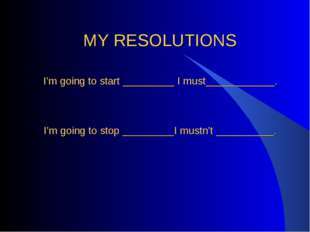 MY RESOLUTIONS I’m going to start _________ I must____________. I’m going to stop _________I mustn’t __________. 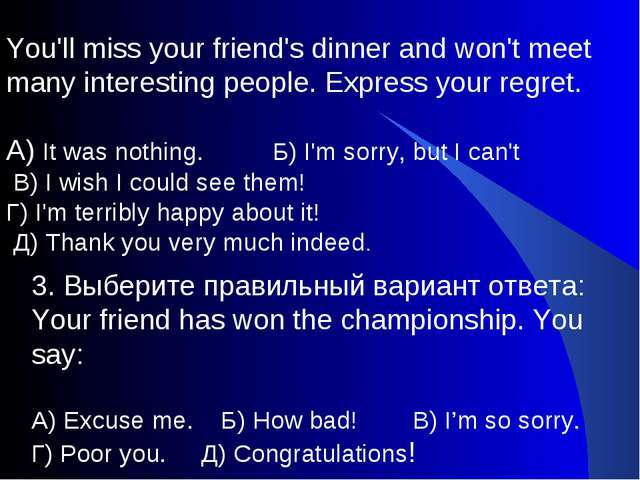 What would you say in the following situations? Choose the correct greeting. 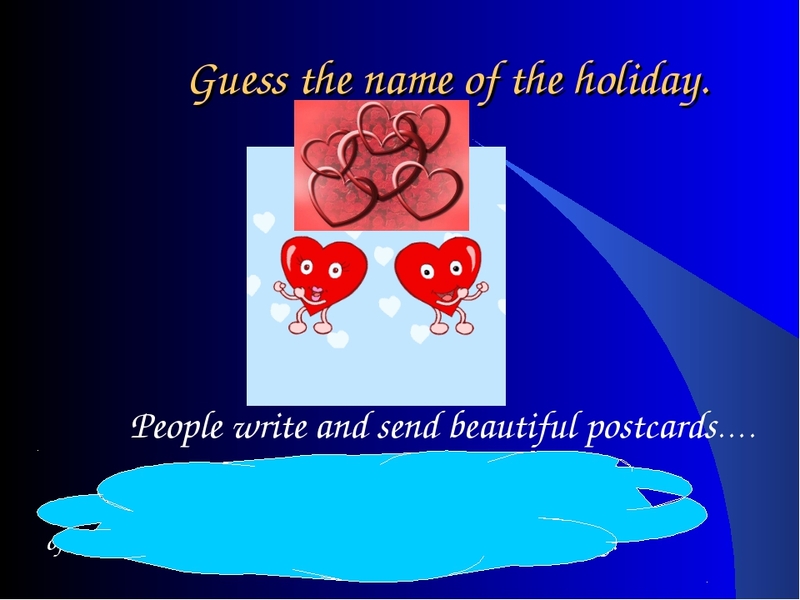 1)	When it's your pen friend's birthday you write: a)Congratulations on your birthday! b)Best wishes! 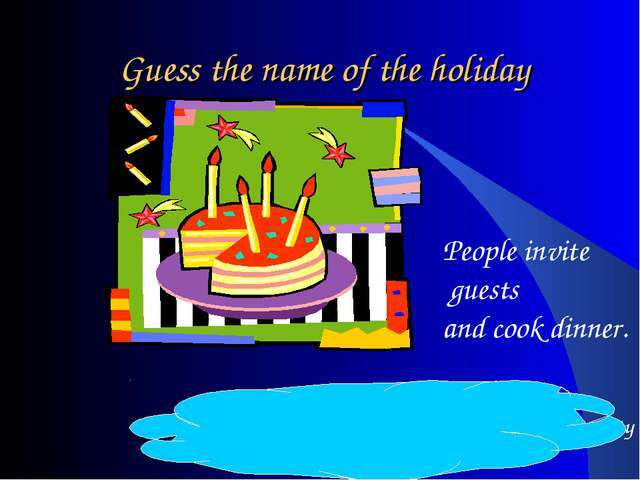 c)Happy birthday! 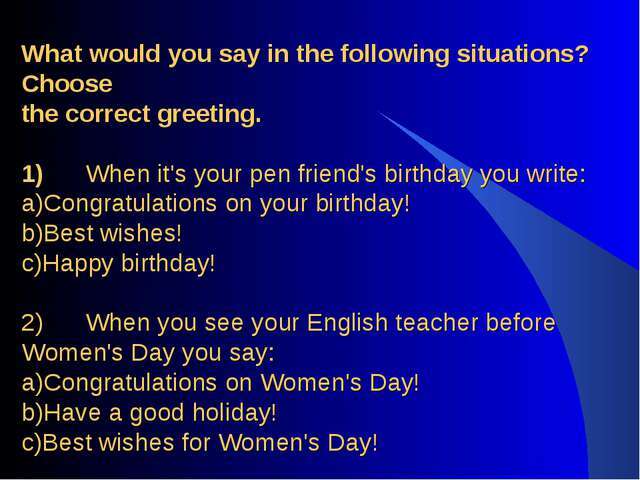 2)	When you see your English teacher before Women's Day you say: a)Congratulations on Women's Day! b)Have a good holiday! 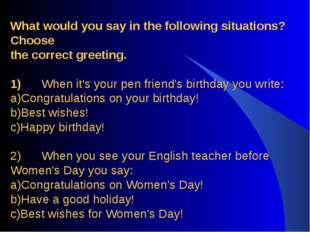 c)Best wishes for Women's Day! 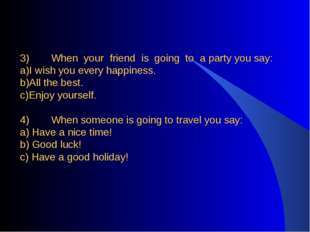 3)	When your friend is going to a party you say: a)I wish you every happiness. b)All the best. 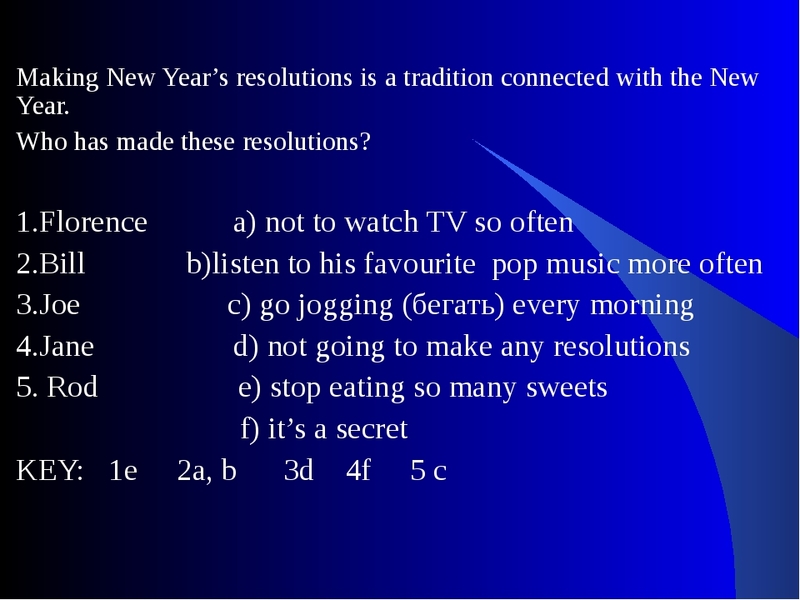 c)Enjoy yourself. 4)	When someone is going to travel you say: a) Have a nice time! b) Good luck! c) Have a good holiday! You'll miss your friend's dinner and won't meet many interesting people. Express your regret. А) It was nothing. Б) I'm sorry, but I can't В) I wish I could see them! Г) I'm terribly happy about it! Д) Thank you very much indeed. 3. Выберите правильный вариант ответа: Your friend has won the championship. You say: А) Excuse me. Б) How bad! В) I’m so sorry. 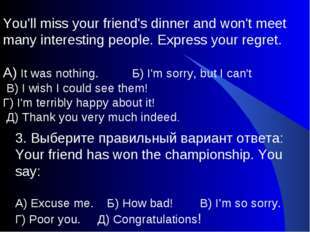 Г) Poor you. Д) Congratulations! 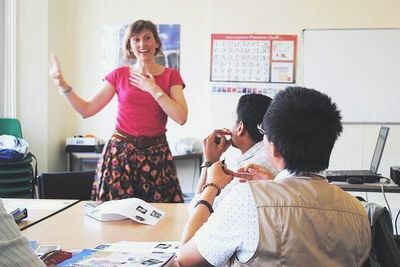 Вставьте пропущенные слова, опираясь на материал учебника о праздниках и традициях. 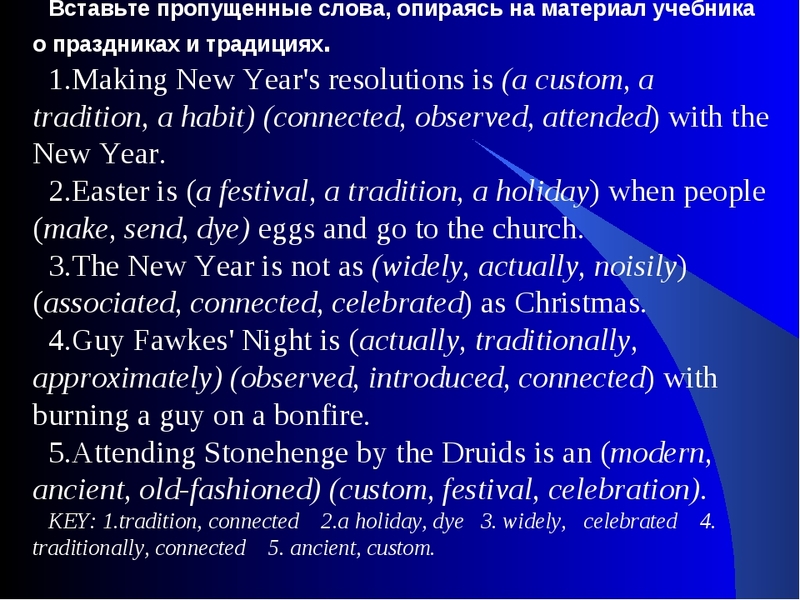 1.Making New Year's resolutions is (a custom, a tradition, a habit) (connected, observed, attended) with the New Year. 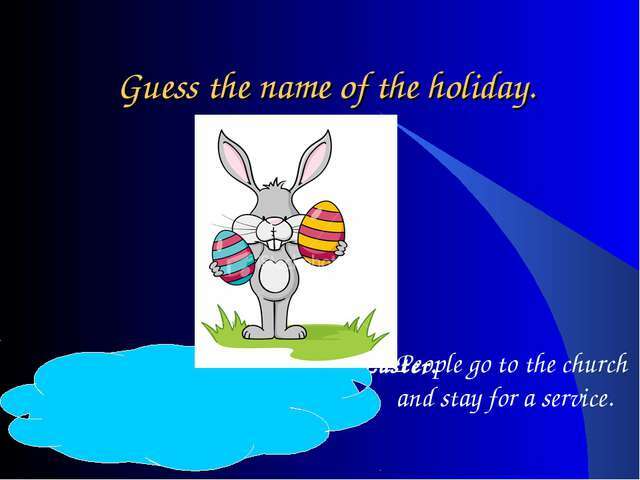 2.Easter is (a festival, a tradition, a holiday) when people (make, send, dye) eggs and go to the church. 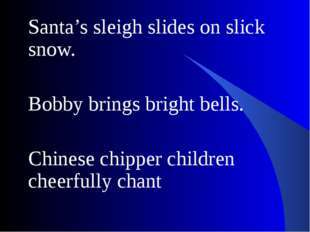 3.The New Year is not as (widely, actually, noisily) (associated, connected, celebrated) as Christmas. 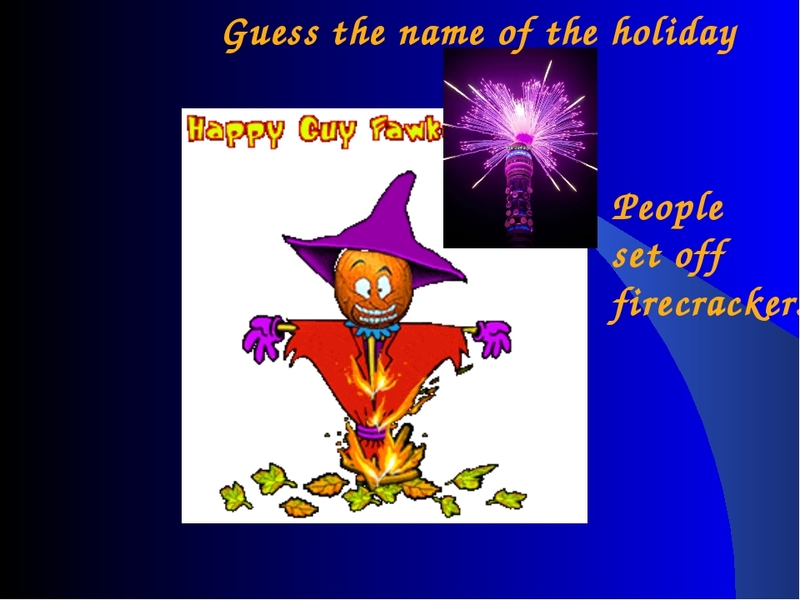 4.Guy Fawkes' Night is (actually, traditionally, approximately) (observed, introduced, connected) with burning a guy on a bonfire. 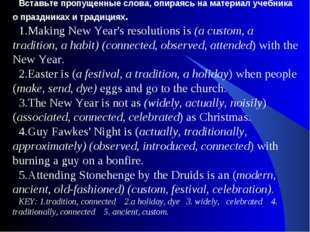 5.Attending Stonehenge by the Druids is an (modern, ancient, old-fashioned) (custom, festival, celebration). 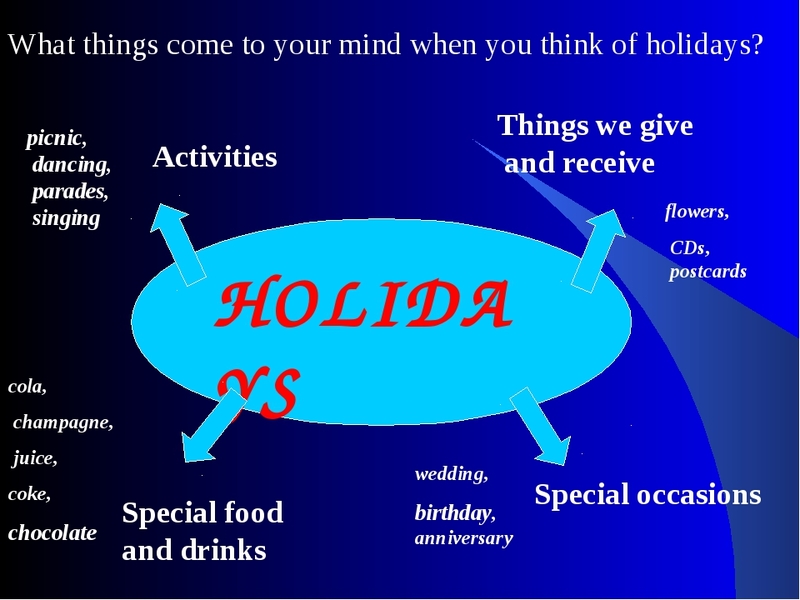 KEY: 1.tradition, connected 2.a holiday, dye 3. widely, celebrated 4. traditionally, connected 5. ancient, custom. 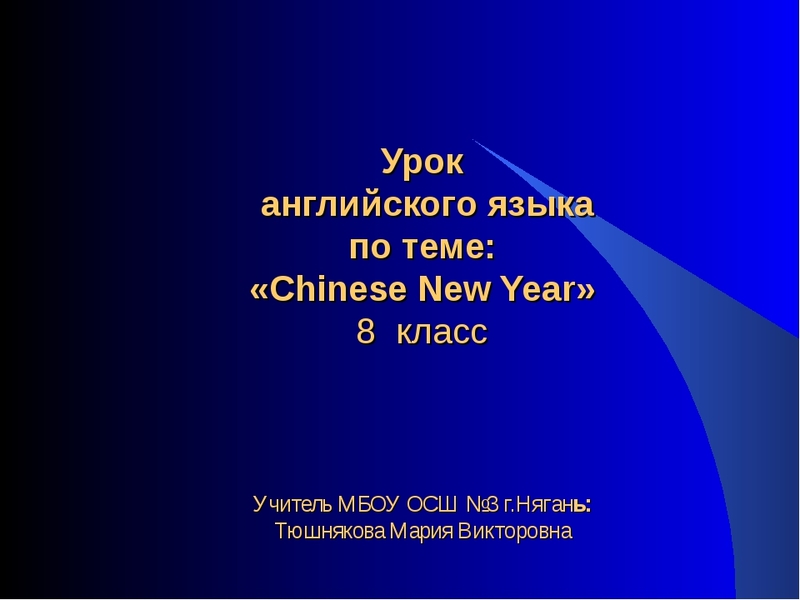 Презентация к уроку английского языка в 8 классе по теме "Chinese New Year" (учебник Кузовлев В.П. ).В данной презентации учащиеся активизируют лексику по теме "Праздники". рассказывают о традициях. связанных с празднованием Нового года в Британии и России. а также знакомятся с особенностями празднования Нового года в Китае, восточным гороскопом по годам рождения. В конце урока проводится игра по типу дайс (dice). 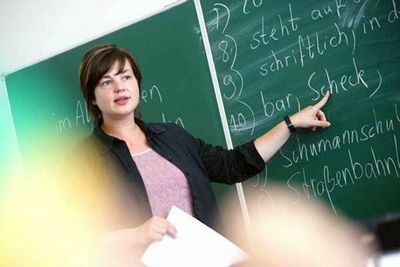 где ребята систематизируют полученные новые знания по теме в соревновательной форме.